A Year of Being Here: Ruth L. Schwartz: "Important Thing"
Ruth L. Schwartz: "Important Thing"
all the other lives she might have lived. The ending doesn’t have to be happy. The hunger itself is the thing. "Important Thing" by Ruth L. Schwartz. Text as published in Edgewater (HarperCollins Press, 2002). Reprinted by permission of the poet. 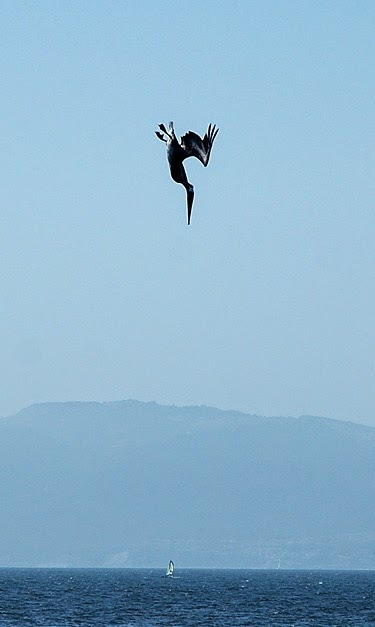 Art credit: Photograph of California Brown Pelican "dive-bombing for fish," taken June 7, 2007, by Alan M. Pavlik. Pat Riviere-Seel: "Prayer for a Field Mouse"
Susan Rooke: "A Marriage in the Hands"
Carolyn Locke: "What the Rain Left Behind"
Sarah Busse: "Evening Walk, Mid-March"
Al Zolynas: "Love in the Classroom"
Ron Padgett: "Inaction of Shoes"
Michael Blumenthal: "A Man Lost by a River"
Arlene Gay Levine: "Each Moment"
Ted Kooser: "A Blind Woman"
Barry Spacks: "What Breathes Us"